The following article, written by ISDA contributor Franesca Montillo, appears on The Lazy Italian. How to order gelato in Italy, really? Do we actually need a blog on how to order ice cream, how hard can it be? First, let’s not call gelato ice cream. I don’t care what the guidebook or translator says! And yes, we do need a post, and here’s why. 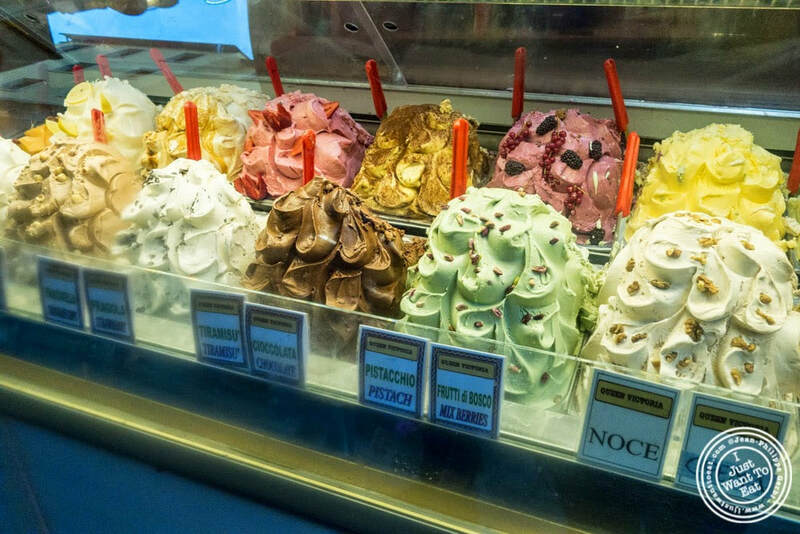 Having real gelato in Italy should be on everyone’s must-do list when traveling there. 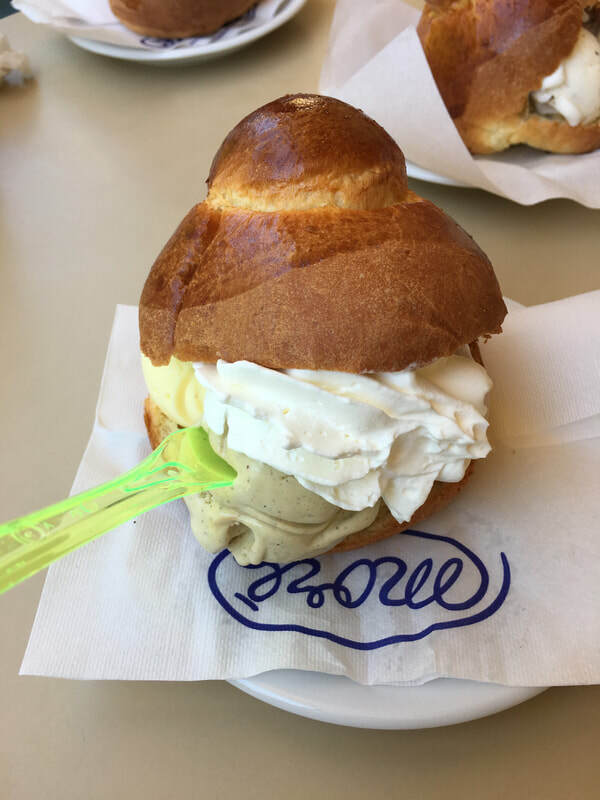 To go to Italy and not stop at a real, authentic gelateria would be like going to Pisa and not seeing the leaning tower, or to Rome and not stopping at Trevi. It’s practically unheard of and you would be doing yourself a disservice. Click here and learn how to make your very own gelato. Perhaps my two faves: hazelnut and zuppa Inglese, which is similar to eggnog but way better! First, let’s identify the recommended location to purchase your gelato. You have the obvious, gelateria, the bar, the pasticceria and even the supermarket. 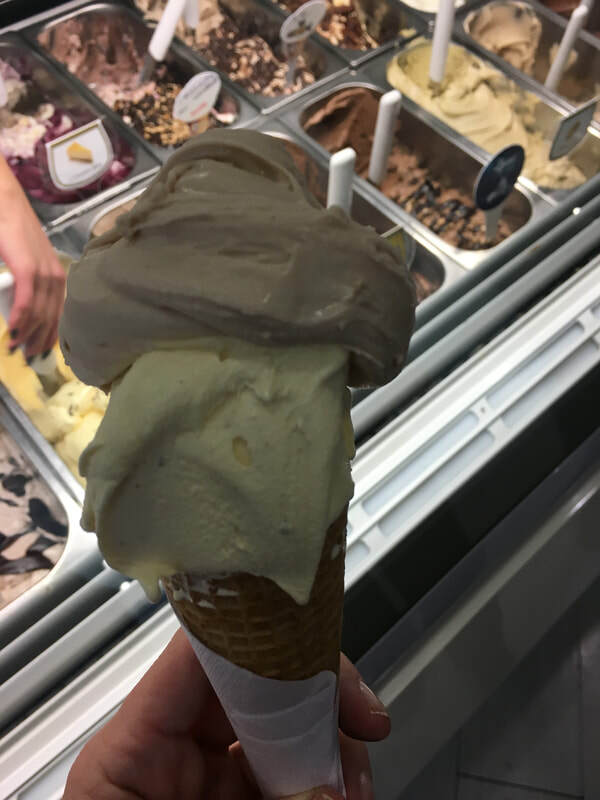 The gelateria is the place to be, where they specialize in just gelato, where you will find the largest selection, the freshest flavors and the most qualified staff to scoop you the perfect gelato. Up next is the bar. Keep in mind that the “bar” in Italy isn’t selling you beer and wine, but it’s essentially a cafe. Their specialty is espresso, cappuccino and morning pastry. They all frequently sell gelato, especially in the summer months. Next is the pasticcerie. They specialize in pastries, such as rum babas, spogliatelle, paragine and so much more. They are delicious and glorious, but they do not specialize in gelato. Like bars, they might sell some gelato in the summer, but it’s not the first place to go if gelato is what you’re after. Next is the supermarket. Picking up some gelato at the supermarket while doing your weekly shopping is a great option. Even the mass produced, packaged gelato is of great quality and far superior and tastier than what we know as ice cream here in the U.S. So, with all that in mind, I highly suggest going to a gelateria for your best gelato experience. Bars are a close second option, and I should emphasize that while their flavor selection is perhaps smaller, the quality is still great. Just another day in front of Dondoli Gelateria in San Gimignano? Worth the wait? Let’s go and you decide! If you are going to go for the gelateria option, there are a few things to keep in mind. If you are used to earting your food first, then paying for it, you’re going to have to change that mentality for the gelateria. You actually pay first. For most shops, when you walk in, you will see a beautiful window displaying their goods. Tucked in some corner in the gelateria, or perhaps in full view, you will see a counter clerk sitting behind a cash register. (Yes, cashiers sit in Italy.) It is there that you go and pay for your treats. Tell him or her what you want and how many, pay accordingly and he/she will hand you a receipt. If you aren’t sure yet what you want, it’s perfectly acceptable to take a peak first, before making your way to pay.Next up, take that receipt to the clerk behind the counter to be served. 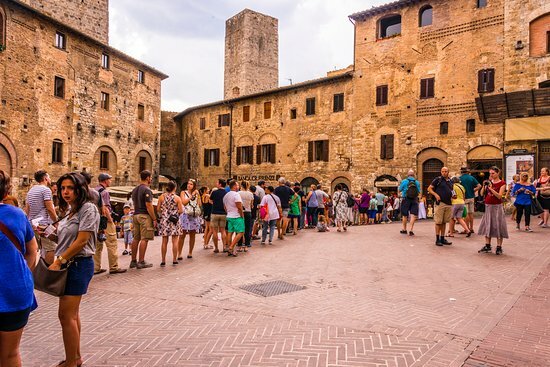 Keep in mind, gelaterie in the summer get very crowded and Italians don’t like forming lines, for just about anything! Be respectable, but do let them know when you are next (if in fact, you are). Usually, waving your receipt to the clerk will get their attention. Being the first customer at a gelateria = Priceless! Look at those fresh mountains of gelato! Next decision to make? Your vessel of choice to carry your gelato. Will it be a cup, cone or panino? Cup requires little explanation, it’s just that. Great for kids to eat while in a stroller, and an equally great option if you are a whipped cream person. Speaking from just what I have seen in Italy, I do believe this to be the least used option, this is just from what I have seen, I don’t have real statistics here!Next up is the cone. Most popular cones in Italy are the sugar ones. Pointy and crisp, they are more widely used than what we know as cake cones here in the States. Some gelaterie make their own, most do not, but you will know if yours is freshly made! It’s delicious and a treat in itself, not just as an option to carry your gelato. A larger waffle cone is also available. A fresh cone almost tastes like a vanilla pizzelle. But my preferred option, the most caloric option, the one that will replace a full meal, is a panino al gelato. It’s exactly as it sounds. A freshly made (sometimes it’s still warm when served!) butter brioche bun, cut in half and filled with gelato, topped with freshly made whipped cream. It’s literally heaven on a plate. If the bun is warm, it slightly melts the gelato a bit, soaking in all the deliciousness. It’s a messy, over-the-top treat that everyone should experience at least once in their life. Or once a day while on vacation. You’re going to want to sit down for this one. 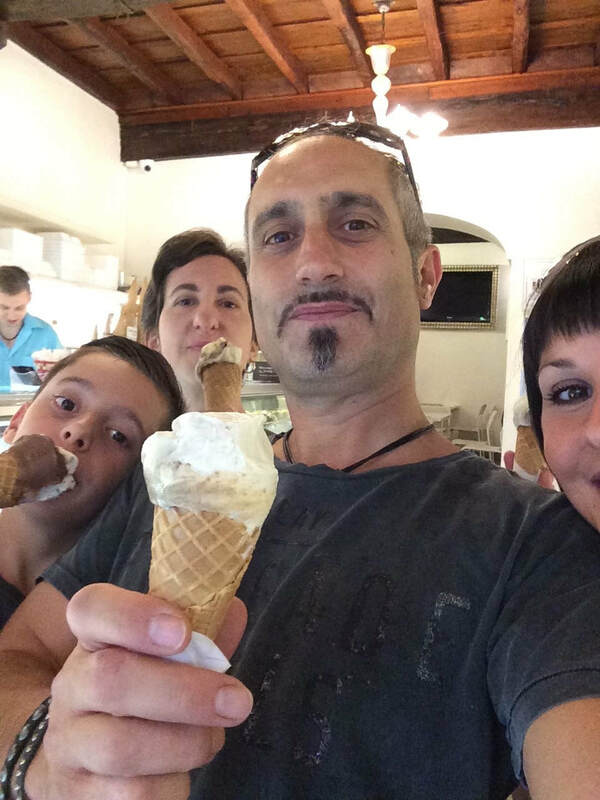 Selfie time with our gelato in Rome! Once you have decided on your vessel of choice and paid for it, it’s time for the most important decisions: flavors. Every gelateria will have the staple flavors: coffee, hazelnut, chocolate chip, chocolate, vanilla, strawberry, pistachio, lemon and the like. If in season, many will have other flavors such as fig, cantaloupe or other seasonal fruit. If you can’t tell the flavor by looking at them, don’t worry, name cards are placed near by, and many are also in English. If in doubt, feel free to point to one and ask: “Che gusto e’?”Meaning, what flavor is that? It’s ok to ask for a sample, if it’s not crowded, even two. But don’t push it, you will not be favored much by the staff if you start asking to try all 30 + flavors! When combining your flavors, keep in mind how they will compliment each other. For example, some of my favorites include hazelnut, coffee, pistachio, lemon, banana, peach and coffee. You can see how some of these will match well, while others do not. For example: lemon and coffee? No thanks! Lemon and peach? Perfectly refreshing! Hazelnut and pistachio are also a great combo. I try to limit my selection to two flavors. I am always tempted to go for three, but find that that can be over the top, even for me. And whipped cream? Always! After all, gelato is made with much less fat than US ice creams, so I am saving on calories there, load me up on the whipped cream! Having a gelato in Italy is an authentic of an experience as anything. A delicious gelato in a great gelateriain a world-class city such as Rome or Florence (or anywhere in Italy for that matter!) might end up being one of your favorite memories of the trip! Panino al gelato! This was pistachio and hazelnut with whipped cream! Yum! Yes, I ate the whole thing! Craving your own gelato? Consider joining Lazy Italian Culinary Adventures! We have three planned! CALABRIA: August 31 – September 7, 2018 Click here for more info! PUGLIA: September 9 – 16, 2018 Click here for more info! Only about 10 people in the world know the complex and extraordinary technique of making filindeu.